SAN CRISTOBAL DE LAS CASAS, Mexico- Thanksgiving, obviously, is not generally celebrated by Mexicans. But the tradition is carried out here by transplanted Americans looking to join together on a major holiday that we call our own. Thanksgiving is, perhaps, the only excuse I have to seek out my fellow countrymen, and, no matter where in the wold I am, on this day I go searching for my national brethren. Around ten years back I tried to celebrate my first Thanksgiving abroad in the mountains of Ecuador. I caught wind that an American couple were having a large Thanksgiving dinner at the traveler’s lodge that they owned in the rolling foothills of the Andes. All Americans were invited. On the specified day I hiked through the mountains over to the lodge. I made my purpose known — “I would like to join you for Thanksgiving.” OK, $20 to enter. I soon found myself on the lee side of a closed door. I think I ate a candy bar for Thanksgiving that year. But it was then that I set out to never spend such a squalid Thanksgiving ever again. So far, I haven’t. This year, I set out to find a Thanksgiving celebration in San Cristobal. I went over to the Traveler’s Home and got the low down from Carlos, a twenty something re-transplanted Mexican who grew up in California — my go to man in this town. He said he was having a Thanksgiving potluck, 8 PM. “Good, that still gives me enough time to watch football.” I was happy that I would not only comply with the first great Thanksgiving tradition — eating a feast — but the second as well — watching the Detroit Lions loose. “Lets go out to the market and get a live one, snap its neck ourselves, defeather, gut the f’çker, and cook it up,” my excitement carried me over the parameters of my situation. I muttered something crude about the retraction of masculinity that results from a vegetarian diet, and resigned to jump on my wife’s mash potato band wagon. Thanksgiving is a safe holiday to boast allegiance to for those who are too limp-wristed or PC to imply in public that they are some sort of religious adherent. This is especially so now that PC credentials have now been returned to the holiday. It is my impression tha the “the people from the Mayflower ate the Indian’s food and then killed them – blah!” babble has now falling by the wayside into cliche. Good thing, as I annoy myself when reminding people that most agrarian societies celebrate a harvest festival at the end of the yearly crop cycle, and that “Thanksgivings” were celebrated long before any pasty white guy in a funny hat stepped on some rock. Harvest festivals are ancient, more than likely spanning back to Gobekli Tepe, and any jabber to try to morally deny someone the privilege of such a holiday is petty PC conceit. Thanksgiving is a harvest holiday, not much different than any other that is practiced all over the world: you eat one last huge feast and then hope you don’t die in the upcoming winter. It is a holiday that just about anybody can relate to. I tried to help my wife make her jalapeño mash potatoes. I burned the garlic to little brown popcorn kernels, then got kicked out of the kitchen. My wife figured that I would be better off drinking tequila. I squeezed a lemon, then an orange into a plastic cup, filled it most of the way up with tequila, topped it off with a little water, then sparked up my best pipe. I, at least, was ready for Thanksgiving. 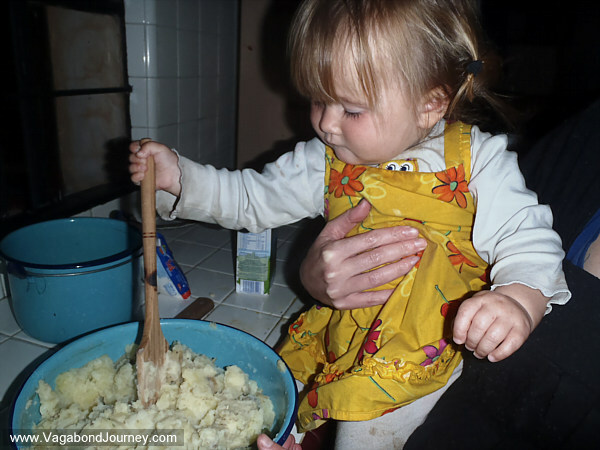 We gathered up our mendicantly mashed potatoes and made way for the Traveler’s Home. On arrival, we found that its inhabitants were also giving thanks. Crammed all together into a small kitchen they stood opaque within a self-generated cloud of smoke. Perhaps they were building up their appetites. Chaya towed our daughter away to play with the chickens. I smoked my pipe and drank tequila. We awaited the feast that would ensue. A large salad was laid upon the table, a stir fry pan full of popcorn too, some goopy looking salsa, and my wife’s jalapeño mashed potatoes rounded out the feast. It was all placed upon a scrap board table that I curiously watched my friend Carlos assembled together — like it was some sort of Lego contraption — a couple weeks before. The last time I left him with the table it was a mess of miscellaneously sized boards, protruding nails, and only had three legs. The table was complete now, it was sturdy enough to bear the brunt of a Thanksgiving dinner. 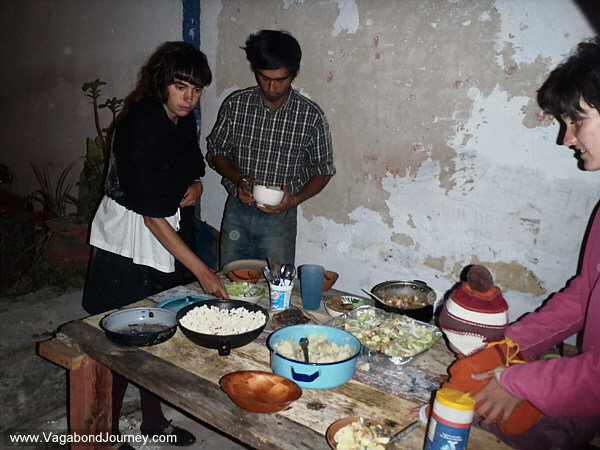 I offered Carlos some tequila, I let him know that I admired what he did with this hostel and that I was pleased to celebrate Thanksgiving with him. We had come close to turning this place into a business, but a long term traveler hideout where we could sit upon a floor littered with dirt, crushed plaster, broken bottles, discordant pieces of concrete, and wood slivers and share a Thanksgiving feast proved to be a better option for our friendship. He puffed on my meerschaum. The rest of the diners were made up of roundabout American wanderers, and a few Mexicans there for the food. Then Cihan the Turk showed up. I published an article about this guy a couple years ago in a Turkish newspaper while staying in his Istanbul apartment. He had since joined us in San Cristobal. He placed an odd looking pan of something upon the table. “What is it?” we all asked. “Machugushuratach, ” he may as well have said for our ability to understand the Turkish names of things. It has cheese in it. Then Carlos brought one last plate out from the kitchen. It was a stack of round flat things. “What are these?” someone asked. “They are tortillas,” Carlos answered matter of factly. “No, really, what are they?” the inquirer continued. “They are tortillas,” Carlos repeated. “I have seen tortillas before, Carlos, and these are not them,” I spoke in an attempt at gaining clarity. The original asker had a point: what we were looking at were flattish round saucers of smushed together grains and sprouts. They looked more like a cross between ultra-grain pancakes and smushed plantains than anything I have previously known as a tortilla. These gritty little Frisbees were certainly nothing like the pale white, floppy, thin tortillas that you get with your tacos at the market. “What!?! If the word tortilla just means a round, flat thing then maybe you are right,” I spoke with finality. Tequila, tobacco, food, friends, family, chickens, and a clear night sky overhead was Thanksgiving 2010 in Mexico. Although I did not get to stuff a bird with its own body parts and then eat pounds of its warm, thick, springy flesh, I did satisfy the full requirements of my country’s harvest festival. I must admit that any subsequent Thanksgiving that I will have probably beats the one I spent sitting outside that traveler’s lodge in Ecuador, freezing, while munching on a candy bar and peering through a window at my fellow countrymen sitting smugly together around a large table — enjoying large amounts of food in a warm, lamp lit living room. Thanksgiving has always been a touch sweeter since I saved that 20 bucks in Ecuador and gained the abject knowledge of how defunct and empty a harvest festival can feel without the warmth of good food, good friends, and family.